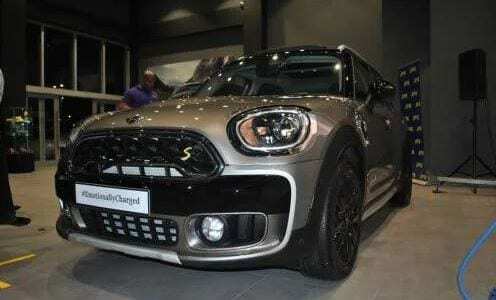 The Mini Cooper Countryman SE ALL4, Mini electric line, was unveiled by ATL automotive last Friday at their Lady Musgrave Road showroom in St. Andrew. The managers of the company said they were looking that would break the mould and push the consumer to stop thinking about the traditional care they would buy. The Mini Electric car is more effective in terms of both performance and fuel efficiency. It uses 129 mpg (miles per gallon) and it goes from 0 to 60 mph in 6.8 seconds. The future was brought to Jamaica and the impressive use of fuel is due to the fact that this is a plug in Hybrid electric car (PHEV) . The Mini Electric car is an all wheel drive vehicle as the two from wheels are powered by gas and the two rear wheels are powered by electricity. When depleted the Mini can be charged by the gas engine while it’s being driven or a plug in charger can be used. The Mini (PHEV) can be plugged in at your home and takes about 3 hours to be charged in your household wall plug. For persons who want faster charging, there is a Mini fast charging Wallbox that will charge the battery in 2 hours. If you lose electric power you still have all wheel drive with petrol. This car is perfect for persons who are serious about reducing the amount of money they spend on gasoline. For persons who are worried about servicing and car repairs, ATL Automotive wants buyers to know that they are trained and equipped to keep these cars on the road, there is nothing for them to worry about. Persons have already bought the cars and they have been satisfied with the performance of these modern machines.